Chris Hartgerink explains how and why he uses R Markdown to write dynamic research documents. The technology is available for researchers to create a reproducible manuscript whereby calculations and graphs are generated computationally – thereby saving researcher time and avoiding human error. We are exploring ways to support life and biomedical scientists who wish to communicate their research in this way. 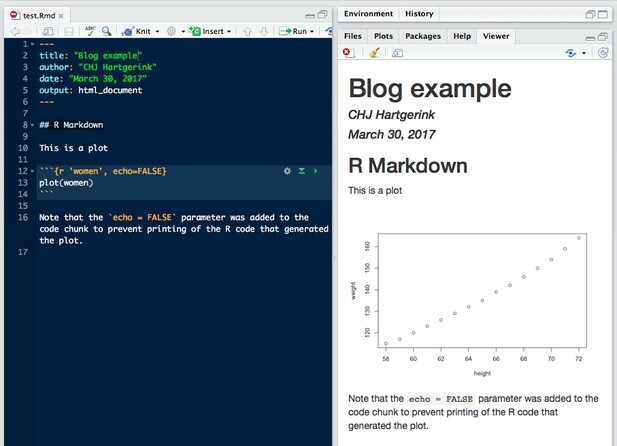 In this post, Chris Hartgerink, a metascience researcher at Tilburg University, the Netherlands, describes how he composes a reproducible manuscript using R Markdown. If you would be interested in submitting your manuscript to eLife in R Markdown, or a similar format, please let us know by email to innovation@elifesciences.org. This week, a paper that was almost three years in the making finally got published (Hartgerink et al., 2017). I feel confident about the paper and the results in it, not because it took three years to write, but because it's the output of a dynamic document that I produced using R Markdown. Markdown is a simple document language, which you can create in any text editor, including Windows Notepad and Notes for Mac. Markdown is supported in multiple tools designed to make life and work easier, including Reddit, Hypothes.is, Github and several blogging and commenting tools. The purpose of Markdown is simply to define the document structure and formatting. For example, the writer can define header levels using hash signs, and easily format text. This makes formatting as you write quick – no more buttons or keyboard shortcuts. Subsequently, the text file can be exported in multiple file formats, including PDF, html and even as a Word file to satisfy co-authors who prefer to use Word's track-changes function. One problem I've worked on previously is checking the accuracy of p-values in the literature. My colleagues and I found that p-values can be mistyped or miscalculated, leading to inaccurate reporting of results, however unintentionally, in half of all papers, and leading to potential changes in the conclusions in one out of eight papers (in psychology; Nuijten et al. 2015). Enabling researchers to insert p-values via direct computation instead of manually copying results from statistical programmes will resolve this issue, for a start. R Markdown is simple and easy to learn and use. I will show just one exciting aspect here. More extensive step-by-step guides are available. If you want to follow along, you will need to follow the steps described below. In RStudio, install the R Markdown package by typing in the console: > install.packages('R Markdown') You will need to select a CRAN local to you, from which the package will be downloaded. Usually, we tend to type results in the running text ourselves, as depicted below. By clicking “Knit”, R Markdown creates a document (right) from a simple plain-text file (left). This is the basic function of Markdown and its associated flavours. Using R Markdown to write a document. However, in this text, we have a p-value that is calculated based on a t-value and the number of degrees of freedom. Let’s make this dynamic to ensure we have the rounding correct. Using R Markdown to generate a document with dynamic results, to ensure accuracy of reporting and reproducibility of results. As we see, the original contained a mistake (p = 0.027 has become p = 0.028) – using R Markdown allowed us to catch that error by using R code to generate and properly round them p-value (i.e., round(pt(q = 1.95, df = 69, lower.tail = FALSE), 3) calculates the p-value and rounds the result to three decimal places). So, there are no more mistakes, and we can be confident in our reporting. Disclaimer: of course, you can still input wrong code – garbage in, garbage out. Further, you can generate plots from your research data within your dynamic document, demonstrated below using an example dataset pre-loaded in R (you can find more example datasets by typing data() into the console). Using R Markdown to dynamically generate plots within a document.